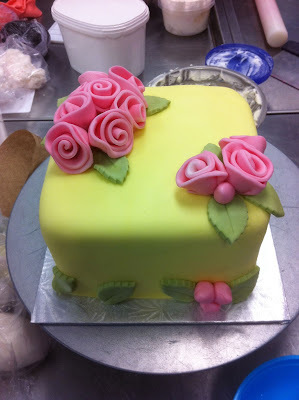 This class was at the Whimsical Cake Studio and was an all-day class that taught us the basics of working with fondant and how to cover a cake. They also taught us how to make some simple fondant decorations such as ribbon roses, big bows, fantasy flowers, roses, daisies, and a bear! My hope for this class was that I could come out knowing how to successfully cover a cake with no tearing/drooping/fondant frustrations any more. It went smoothly in class, so I have high hopes that the next cake I attempt alone will be a success! I only got this one picture of the cake before I gave it away, I was definitely not on my A-game with the picture taking that day. Thank you for the awesome class John!